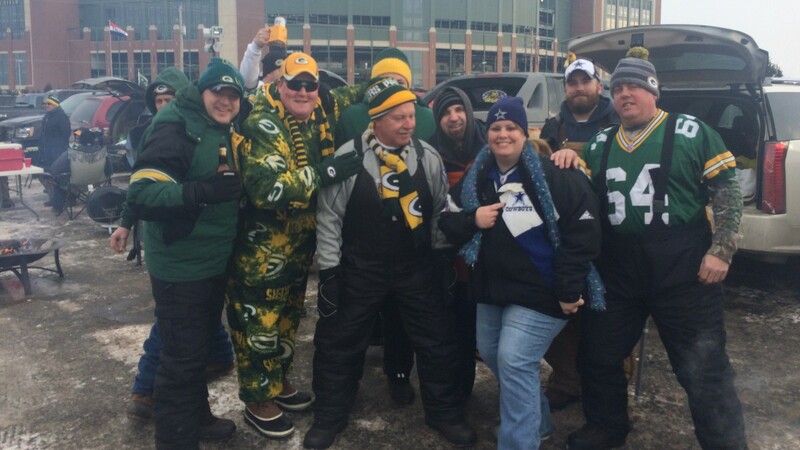 “It’s not a Snuggie,” longtime Green Bay Packers fan Zach Munger corrected me when I approached him on Sunday morning in a parking lot to tell him I admired his fleecy outfit. “It’s a custom onesie.” Everywhere around us, smoke and steam rose: from tiny portable grills, from truck exhaust pipes, from the paper mills and factories in the middle distance. Between all the big, burly bodies idling around and the Packers’ color scheme, the tailgates outside Lambeau Field had the look of a John Deere dealership. As we discussed the finer points of Munger’s green-and-gold garment, we were interrupted by his godfather. He proudly thrust a Tupperware full of marinating kebabs at us. A few hours later, that prediction wasn’t looking so good. But then again, much of the buildup leading into Sunday’s matchup had been a little bit off. By the beginning of the second half, when Romo handed off the ball to star running back DeMarco Murray, Green Bay looked more like the team getting stuck. Murray noticed a gaping hole in the coverage and sprinted toward it. There seemed little doubt he’d break 59 yards down the field for a touchdown to give Dallas a 21-10 lead. (Not an insurmountable deficit, but an injured Aaron Rodgers had been visibly laboring all game, wincing and sailing throws and at one point having to skip rather than walk.) But Packers defensive end Julius Peppers dove at Murray, dislodging the ball from his grip, and Green Bay recovered. A subsequent field goal made the score 14-13 instead. We had ourselves a game. It took three days for Tom Benning, alias Fan Man, and his buddy Chuck Miesfeld to drive from Green Bay to Dallas to watch the Packers play in Super Bowl XLV. A snowstorm dumped 20 inches across Oklahoma, and “GB Brat,” as the men’s big gold-and-green party RV is called, wasn’t exactly optimized to handle the conditions. Still, they made it in time to see the Packers beat the Steelers 31-25. On Sunday, the enormous vehicle seemed much more at home parked outside the arena beside two other fan vans, one a big yellow school bus called “Das Büs” and another a retro 1966 Dodge Camper, “Big G,” that Benning cited as his inspiration. “We’ve been at every home game for 22 years,” said Stephen Gay, Big G’s owner, as his 14-year-old golden retriever Blayde snoozed nearby. (Gay noted that he was able to make that drive to Dallas in 20 straight hours, but that “chunks of my tire broke apart” in the conditions.) 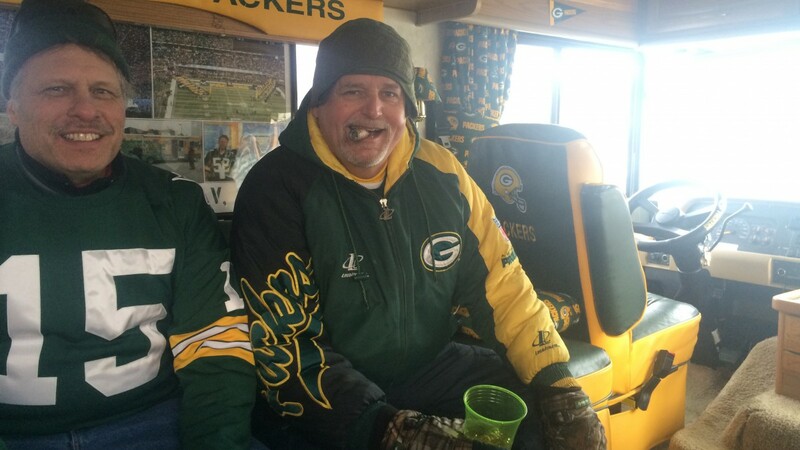 Gay, who watches all Packers games from inside his camper, paused to chat with a man who had poked his head into the bus. A few hundred feet away, a big crowd was gathered inside and out at Kroll’s, one of those places where everyone tells you to go when they find out you’re heading to Green Bay. (“Get the butter burger and cheese curds!” has to be the most Wisconsin sentence imaginable, and it’s also great advice.) On Friday, I had stopped in for lunch after a press conference at Lambeau and within about 10 minutes was trying on two Green Bay Super Bowl rings. The gregarious owner, Mike Weir, who, besides running the restaurant also sits on the Packers’ 45-person board of directors, likes to come hang with his patrons and show off his goods. The Packers’ unique ownership structure is the stuff of legend, and for good reason. On one side of the matchup Sunday you had Jerry Jones, the very Monty Burnsian archetype of the über-owner, and on the other you had 360,000 Packers shareholders, a good many of them raving, loving, lunatic fans. There’s no other team like it, because now there can’t be: NFL rules now mandate that teams may have no more than 32 owners, at least one of whom must hold at least 30 percent. Green Bay’s situation was grandfathered in. Owning a share of the Packers gets you into an annual meeting and a few other perks, but it doesn’t promise any access to the most sacred of Packers swag: the season ticket. “I married two tickets to each game and got a wife in the deal also,” one Packers fan told me. Just about everyone in town knows of someone who has fought over season tickets in a divorce; the smart ones know to sign a prenup. 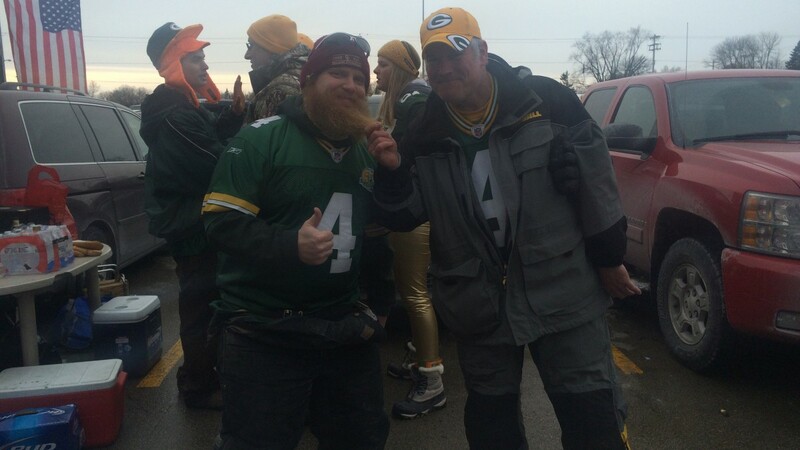 On my way into the stadium, I ran into a man with a long, bushy, reddish beard who looked a great deal like one of the latest characters in Packers lore. In a December game against the Detroit Lions, TV cameras captured an injured Aaron Rodgers stroking the beard of a man on the Green Bay sideline. Rodgers returned to the game in the third quarter and led a touchdown drive, and pretty soon the bearded guy, who is a Lambeau Field contractor named Jeremy Wilcox, became something of a meme. As if that weren’t enough, Brett Favre’s dead ringer was standing there too. Kirk Ermatinger has the crinkly eyes, salt-and-pepper scruff, and assured walk of the ol’ gunslinger. People take pictures with him and ask him for autographs all the time. Ermatinger said this had been happening “since day one” and then swiftly grew serious. The crowd inside Lambeau wasn’t the sea of green I thought it would be — there were too many guys wearing puffy hunting suits in camo or bright orange for that to happen, and there were a surprising number of Cowboys fans in the stadium, too. (All the ones I met made a point of saying how well they’d been treated.) But it was loud, and everywhere there were cheeseheads, and when DeMarco Murray made up for his fumble with a 26-yard run followed by a 1-yard touchdown to give Dallas a 21-13 lead late in the third quarter, you could feel the collective nervousness seep through the thick press-box glass. I considered all of these colorful folks — onesie guy, the van men, the owner of Kroll’s, the impostors — out there in the cold and wondered what they were thinking. Rodgers led a drive from Green Bay’s 20-yard line that culminated with a terrifying, threaded needle to Richard Rodgers in the end zone. It was a sliding-doors moment: You could actually visualize the alternate universe in which the ball was picked off even as the Packers players celebrated the completion in front of you. With about four minutes left in the game and the Packers up 26-21 (they’d missed on a two-point conversion after the Rodgers-to-Rodgers touchdown), Romo and his otherworldly receiver Dez Bryant connected on the kind of play that opposing fans hold their breath over in any Dallas game. Finally, the verdict came, and certain phrases began flying: “Calvin Johnson rule,” “football move,” “lost control of the ball.” And the one that mattered: “incomplete.” An accurate ruling based on a despised rule, and one that not only negated the near touchdown pass but also forced the Cowboys to relinquish the football on downs. The crowd’s cheer of relief was probably the loudest I heard all game. It had the air of a buzzer-beater, but there was still lots of time left — 4:06, to be exact. Twice the Packers faced a third down, one with 3 yards to go that Rodgers converted for 26, and the other a third-and-11 on the Dallas 35 that, if not made, would have set up a difficult decision on the next play. But Rodgers hit Randall Cobb for 12 yards, and despite Cobb’s silly penalty for throwing the ball in celebration, the game was effectively over as the Packers ran out the clock. When I left Lambeau a couple of hours later, the parking lot was mostly empty. A few coal deposit boxes sat quietly smoking. And a few hundred yards away, the yellow Big G minibus rolled down the road, looking like a giant banana slug. I don’t know whether it’ll be making the trip to Seattle next weekend, but I have a pretty good idea. The weather was below freezing, to be fair, but in comparison to the subzero temperatures of the prior few days, it felt almost balmy.